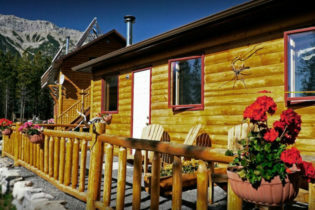 Welcome to the Aurum Lodge, a Bighorn Country eco-tourism accommodation in the Canadian Rockies, near Banff National Park. The lodge was designed to cause minimal environmental impact, and is operated using best practices in green management. Nature lovers from all over the world come to this beautiful region to relax in a pristine setting. We offer 6 guestrooms with full breakfast service, as well as 3 self-contained units for guests who prefer to look after themselves. Nestled in the front ranges of the Canadian Rockies, overlooking Abraham Lake, surrounded by pristine forest, the Aurum Lodge is a true wilderness retreat. Make us your home base for exploring Banff and Jasper National Parks! We offer self-contained units with fully-equipped kitchens for guests who prefer to look after themselves. Please visit our website for more details on our popular photography tours and workshops. Dinner is an available option for guests in the lodge rooms, and breakfast is included with the lodge rooms.